The National Safety Council (NSC) Congress & Expo is the world’s largest annual event for environmental, health and safety professionals. This year, the show, which was held in Houston, Texas, hosted 1,100 exhibiting companies and welcomed close to 15,000 decision makers, end users and distributors from the United States, Canada and more than 60 other countries. One of the companies attending was Acme United Corp. (NYSE American: ACU – $17.87). The NSC Congress & Expo is Acme’s biggest marketing event of the year in the first aid category. As such, it gives a good indication of the outlook for the industry and Acme’s first aid and safety brands. The Company had a 20×30 booth at the show, its largest one ever at the event. Acme showcased its latest and upcoming products for the First Aid Only, PhysiciansCare, and Spill Magic brands. 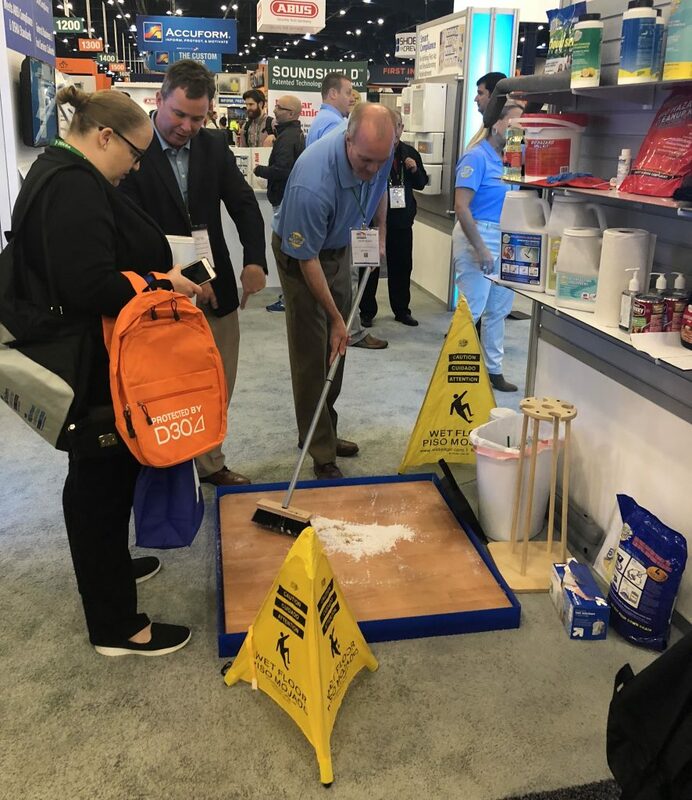 An Acme United representative demonstrates the Spill Magic spill pickup products at the NSC Congress & Expo. Acme, for example, showed its latest SmartCompliance cabinets. Most businesses are federally mandated to have first aid solutions that are compliant with OSHA as well as ANSI standards. The SmartCompliance first aid supply cabinets ensure that businesses are covered. The innovative design of the SmartCompliance cabinet eliminates disorganized and missing supplies often seen within traditional first aid cabinets. As first aid products are used, the SmartTab ezRefill reminders notify a user when it’s time to reorder so that supplies never run out when it matters most. Today, there are about thirty different configurations. Depending on the number of people in an organization and the type of business it is in, FAO has the suited SmartCompliance cabinet. 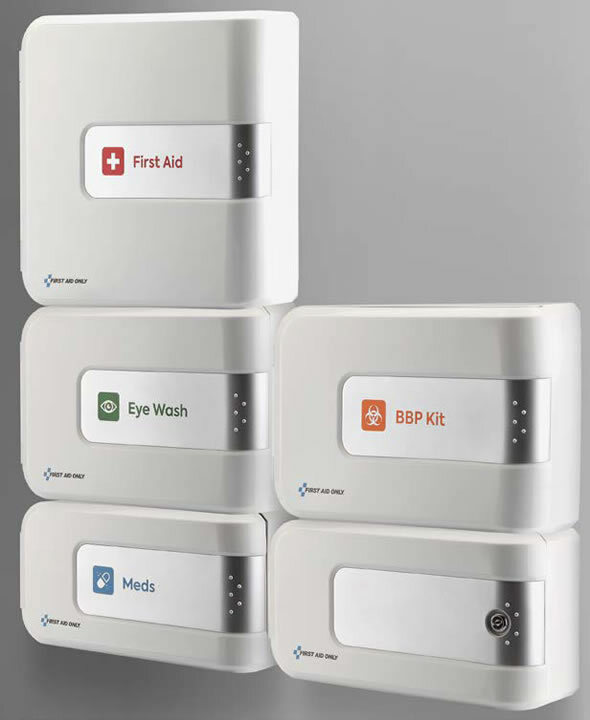 The First Aid Only SmartCompliance Complete Cabinet. Another highlight of the show was the latest evolution of the SafetyHub app. The First Aid Only SafetyHub app, which is available for both Apple and Android, was released in July 2017. It provides a platform to manage and refill the SmartCompliance cabinets. New first aid cabinets can be registered through the app, and can be assigned to, and managed by, multiple users. So for example, a user can open the cabinet and check for products that have run out or a SmartTab card sticking out. The user can then scan the items that need replenishing with his mobile device on which the app is installed and send the order to the purchasing director for approval, or directly to the first aid distributor of choice. The app also helps companies to remain OSHA compliant as it clearly shows how often a cabinet is inspected and by whom. In a previous update, FAO significantly broadened the capabilities of the app, as it was able to track anything in a facility that needs to be either serviced, replenished, or calibrated at certain intervals. For example, the expiration dates of all fire extinguishers in a facility can be uploaded into the app. Subsequently, 30 or 60 days before the due date, the user would get a push notification on the app alerting him to order new extinguishers. This also works for Automated External Defibrillators (AED’s), in which batteries need to be replaced every so many years. The latest update to the app even provides predictive analytics for its users. SmartCompliance’s main competitors are the van delivery companies. Their model is very different though. A driver will periodically go to every site to check the cabinets and refill the products that are missing. This model offers very high service, but also carries a hefty price tag to remain compliant. In today’s world, where companies are very competitive and concerned about costs, the van delivery system may have seen its heyday. FAO’s SmartCompliance design also meets every workplace’s first aid needs, while providing the customer complete control of what to order at a much lower cost. Acme’s booth at the NSC attracted lots of quality traffic, such as safety managers, distributors, and buyers from major customers. A clear indication that first aid continues to grow at Acme United. As more and more companies understand that they need to become, and stay, OSHA compliant, and can do so at a fraction of the cost of the “old” van delivery model, the choice is obvious. Consequently, First Aid Only and its SmartCompliance cabinets have plenty of room to grow in an estimated a $1 billion US market.